Graduation is over. And has been. Thank god. Not that things have quieted down for us, because they haven’t. But that’s life I guess. I have tried to write this post several times since then. It’s harder to write than one might think, but I think it’s important. So here goes…. 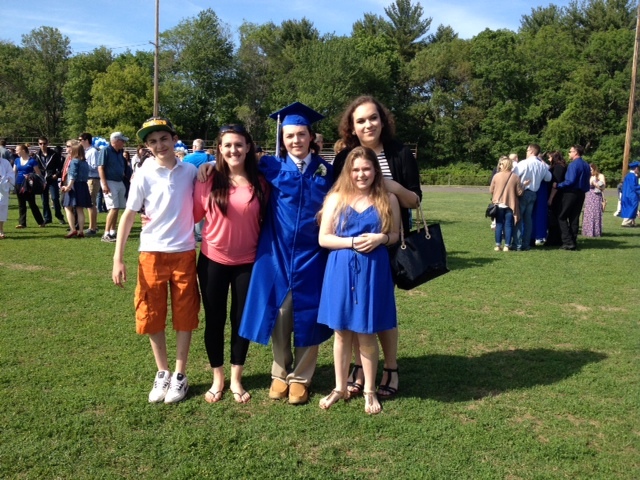 The excitement leading up to Jay J’s graduation was an anticipated feeling. I had been there done that with JoDee already, so I knew the flood of emotion as Jay J started the processional. And I knew that I would be crazy busy putting the final touches on the party for after the ceremony. The list of things to do seemed endless, but alas, the day came, he got his diploma (and not a note inside that see you at summer school first sucka, which is always a possibility!) and we partied like rock stars until the wee hours of the morning. Actually, no we didn’t. I was in bed by 10. Dead asleep. But you get the drift. It went fine. Perfectly. No issues. JoDee did not relapse as I had assumed she would, and the day was good. Mostly. There was only one small issue. As we walked into the football stadium that I had graduated from a mere 21 years before, I was only thinking of getting a good seat so I wasn’t really paying attention to people around me. I was honing in on a golden spot at the top of the bleachers so no one could block my view and so I could lean against the railing without anyone being behind me. As I started the climb up the metallic steps, careful not to fall like an idiot in between the slates, I spotted someone I went to high school with. She greeted me with a warm hello, a quick hug, then with a serious face, dropped her tone asking “How’s JoDee?” I was sort of taken aback for a moment. First of all the hushed tone insinuates that it’s private, whispering so no one hears, hushed so not to let others in on the conversation. But I didn’t pick up on this at first. I was sort of confused, I looked behind me to see if she fell, but she was walking up the steps to catch up to me. I looked at her, confused, and said “fine, why?” Glancing from side to side, she whispered apologetically, “I read your blog.” Oh. That. Hmm. Hadn’t thought of that. I hadn’t really put into perspective what writing my family business on the internet for anyone, anywhere, from sea to shining sea, would mean. It means, I have no secrets and everyone knows our bizniz. So, in-of-itself that isn’t really bad, I mean, that is the whole point of this blog- bring awareness to people about addiction, that it isn’t scumbag losers who steal and kill to get drugs. Addicts do become that sometimes but they started as someone’s loved one, and even if they die that way, someone somewhere still misses them, wanted better for them, is grieving for them. I’m not ashamed of JoDee’s addiction. I’m not even really ashamed of her behavior, and I’m certainly not ashamed of mine. Anything I did in an effort to save JoDee from herself is not something I will regret. I probably will regret somethings I didn’t do, that now I realize I should have done, but that is sort of not the point here. The point is that a lot happened in that few seconds. And it took a few seconds for my brain to catch up. Once I recovered from my what-the-effing-eff-is-happening moment, I thanked her for reading the blog and explained that the purpose of the blog was to educate people that addiction is not a dirty word, a miscreant in a family of moral beings, a reason to whisper. And she smiled her beautifully polished, almost glow in the dark, white smile and I headed up to my spot on the bleachers. Sending a message and realizing the message is not being realized but is being heard is something completely different. (If you understood that sentence you are a better person than I) As I took my spot against the railing as I had hoped, I had plenty of time to look around and think about how many people in that audience knew about my families struggles. I had over 20,000 views on the blog by then. That is a lot of people. Are they all people who want to know about addiction? Or are they wrong-doers trying to relish in my misery? People who disliked JoDee that were enjoying how tough things had been since she left school? The biggest question was did that even matter? Did it matter to me if people who disliked me or anyone in my family, enjoyed the pain we were in? And the answer was of course it matters! Hell yes! People please. I would lying if I said it doesn’t urk me a little bit to think that my nemesis hears my melees, thriving on my pain and suffering. I would be lying if I said that I wouldn’t do the same! How many of us have seen the person that took our place in someone’s life and felt just a little bit gleeful when you realized you were better looking? Isn’t it a wee bit gratifying when someone at work who gave you a terrible time is finally get a terrible time from someone else? It’s a terrible concept but it happens. I also know first-hand that unless you have dealt with addiction yourself, you have no idea how painful it is. Anyone that finds some gratitude to karma for my child’s misdeeds, just doesn’t know any better. And the karma bus has a funny way of turning on you when you least expect it. So, I decided, I’m not going to worry myself about that. The point of this blog was to help others like me. Let people know they aren’t alone; find some comfort in numbers, sorta kinda. If there are people who read for the merriment of my discomfort, I sat to them, have at it. But I would watch the rearview mirror for the karma bus, because it always comes around. Although, for the briefest of moments, I felt completely vulnerable, I realized I was the most vulnerable when JoDee was in active addiction. 900 times. Not climbing the stairs to graduation and being reminded that my words are everywhere. I’m glad people read the blog. For entertainment, for spite or because it is helpful to someone in a similar situation. For me, it is cathartic. It feels like a little bit of something I can control in an uncontrollable situation, and it documents something so horrendous I never want to repeat it again… if we don’t pay attention history can repeat itself. 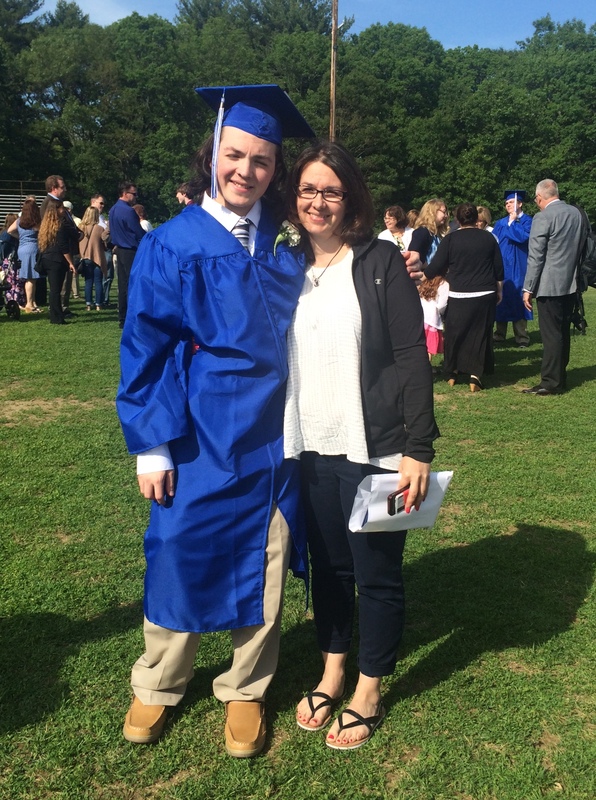 So before the band even started to play the first note of Pomp and Circumstance, I had realized, worried, pondered and got over it which gave me the time to cry, laugh, cry and watch my second child, my oldest son, the serious one, walk across the stage wearing his classic white sunglasses, to get his high school diploma. Delighted and overwhelmed with pride that I had my family surrounding us. Clean, alive, and together.